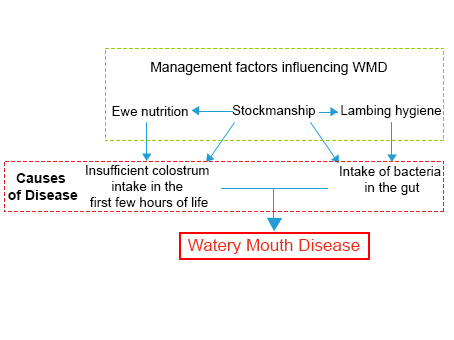 Watery mouth disease (WMD) is an important bacterial disease of neonatal lambs, especially in an intensive indoor situation. It is most common in lambs between 6 and 48 hours old and can cause severe losses, with morbidity sometimes reaching 24% and mortality of those affected as high as 83% (Eales et al., 1986). A combination of factors is responsible for the development of watery mouth. Lambs that have not received sufficient amounts of colostrum are most vulnerable to the disease. These lambs are infected during the first hours of life when they ingest large numbers of Escherichia coli (E. coli) from the ewe’s fleece as they seek the udder, or if their bedding is soiled. The bacteria pass from the abomasum into the intestines. In older lambs, the bacteria are destroyed by acid in the stomach, but in newborn lambs there is no acid (pH=7). In the intestines, the bacteria multiply rapidly, and only when they die do they release endotoxin. A small quantity of endotoxin does not cause a problem, but if large quantities are produced, movement of the gut is depressed (Eales et al., 1985; Gilmour et al., 1985), which leads to further bacterial multiplication and more endotoxin is produced. If the amount of endotoxins produced exceeds the capacity of the liver to destroy it, endotoxaemia occurs, producing the clinical signs of watery mouth (Hodgson et al., 1989). The initial clinical signs of watery mouth are those of a dull lamb, which within hours shows the characteristic excess salivation. The lamb will become progressively more dull, refuse to feed, collapse and salivate more profusely. Abdominal tympany (swollen gut, full of air, “rattle belly”), and diarrhoea is often observed. The affected lamb will die within hours. Watery mouth is most common in intensively farmed flocks either indoor flocks or high stocking rates at pasture (Henderson, 2007). Doubles or triplets from lean primiparous ewes are at greatest risk, as this is related to poor early colostrum intake (Eales et al., 1986; Henderson, 2007), as well as lambs born to housed flocks later in the lambing period, when build up of bacteria in the environment is at its highest. Lambs are unlikely to become infected with watery mouth disease if they ingest plenty of colostrum during the first 6 hours of life and if they are prevented from ingesting significant numbers of bacteria. Colostrum production is influenced by ewe nutrition. Farmers should aim for healthy ewes in good condition prior to lambing, paying particular attention to those carrying multiples or those in poorer condition (Eales et al., 1986). 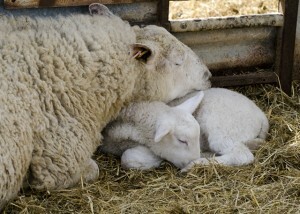 Close attention at lambing time should be given to lambs at risk. These lambs may have to be supplemented with colostrum. It can be useful to store colostrum from ewes having singles and producing plenty. Commercial colostrum can be used in emergencies as a supplement, but not as a substitute. There is no substitute for true colostrum; if ewe colostrum isn’t available then cow or goat colostrum is better than artificial alternatives. For more information on sheep nutrition, please click here. Some management measures can be taken to prevent the intake of large numbers of E. coli. lambing pens should be cleaned out regularly and well bedded with clean dry straw. Winter shearing and dagging of the ewes prior to housing may also reduce the challenge. The application of rubber rings for castration and tailing should not be carried out during the first day, as this may discourage lambs from sucking vital colostrum (Henderson, 2007). When lambs are first born they must have a sufficient amount of colostrum to avoid watery mouth disease and other conditions such as hypothermia and starvation. Watery mouth disease is a combination of insufficient colostrum intake, and ingestion of bacteria from the environment. 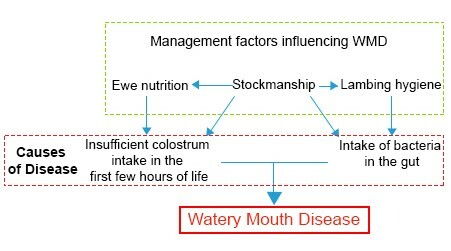 Ewe management is crucial in preventing watery mouth. A healthy ewe should lamb and mother well and produce enough colostrum for her offspring whereas undernourished ewes can often exhibit poor maternal care and produce less colostrum and milk. Feeds by stomach tube of glucose/electrolyte solution, three times a day. This prevents starvation, relieves dehydration and stimulates gut movement – Do not feed colostrum or milk as they will be unable to digest the food. Once body temperature is returned to normal (39 degrees Celsius) and abdominal distension is reduced, then normal feeding can resume. Affected lambs are often hypothermic and this must not be overlooked, they should be warmed in a warming box or under an infrared heat lamp (J. Childs, personal communication). 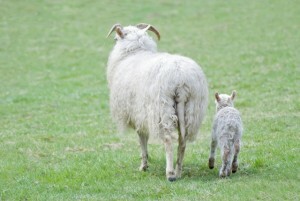 Frequently monitor any affected lambs and leave them with the ewe unless they are very sick. Continue this treatment until all symptoms have gone and the lamb is sucking well from the ewe. If the incidence of watery mouth on the farm is high, measures should be taken as part of the Flock Health Plan to reduce the incidence. Stockmanship, hygiene and ewe nutrition may all require special attention in order to reduce watery mouth on the farm.